The film opened with an almost-dead male (Matt Damon) being plucked from the Mediterranean waters 60 miles south of Marseilles, France by an Italian fishing boat. He was found to have two bullet wounds in his back, and a surgically-implanted capsule with a red LED display was also located in his hip implanted under the skin. It contained the number of a Zurich, Switzerland bank account. When he awakened, he was unsure about where he was and why. [Back at CIA headquarters in Langley, Virginia, it was confirmed to project director Ted Conklin (Chris Cooper) that a "mission failed" - a reference unclear in the film at this point.] Onboard the fishing vessel for a few weeks, the amnesiac realized, to his own surprise, that he had skills in tying nautical knots, and could read navigational maps, as well as speak various languages. When they landed in France, he boarded a train to Zurich, Switzerland. He was accosted by two German-speaking police for sleeping overnight in a park, and again exhibited a surprising ability to fight and handle a firearm to evade them and render them unconscious. The amnesiac approached Zurich's Gemeinschaft's Bank the next morning - knowing the number of his safe-deposit box from the embedded capsule. When he opened the box, he found $100,000 cash in various currencies, credit cards, airline tickets, six passports with different names/nationalities (and his picture on all of them), various devices/tools, and a 9 mm Sig-Sauer pistol. He adopted the name "Jason Bourne" from the US passport (identifying him as from NYC): "My name is Jason Bourne. I live in Paris," and then took everything except the handgun. He realized he was being pursued after one of the bank employees, one of the CIA's sources, placed a call about sighting him. Bourne was pursued by police and other authorities in and through the US Consulate, as the alert was sounded and the building was evacuated. He found he could scale the outside of the building. He then teamed up with German student vagabond Marie Helena Kreutz (Franka Potente) as a hitchhiker (for a fare of $20,000) bound for Paris in her old, tiny red Austin Mini Cooper. After the CIA had been alerted, Conklin ordered from CIA headquarters: "I want Bourne in a body bag by sundown." He was now a target to be eliminated by other Treadstone operatives or assassins (called "assets") because the CIA was embarrassed by the botched mission. Three assassins were contacted and dispatched to Paris: The Professor (Clive Owen) from Barcelona, Manheim (Russell Levy) from Hamburg, and Castel (Nicky Naude) in Rome. In a Treadstone Safe House in Paris, CIA logistics coordinator and operative Nicky Parsons (Julia Stiles) aided the effort. At a train station, Bourne stashed the money in a locker, while Marie remained in the parked car, although she left briefly to buy some liquor. Although he argued that she should go to the police "before this gets any worse" to clear her name ("You tell them everything that happened. Everything. They're gonna believe you. They have to believe you") while he went on the run, she decided to remain with him - signified when she fastened her seatbelt, as police approached and he told her: "Last chance, Marie." The film then featured a harrowing, lengthy and speeding car chase sequence between Bourne, who was driving Marie's Mini Cooper, and Parisian gendarmes that took place on Paris' streets and back alleys (and even down steps, along sidewalks, and the wrong way down a crowded thoroughfare). They ditched the car in an underground parking garage so that they couldn't be easily traced. [In the Hoffenmeim Morgue in Paris, Wombosi was called upon to identify the planted body of 'John Michael Kane' - and said: "It's not him. This man was not shot." Nicky again notified Conklin of the failed plan: "He didn't buy it." Frustrated, Conklin ordered the Professor, a deadly sniper now in Paris, to perform another hit on Wombosi - and then frame Bourne for the killing.] Meanwhile, in a hotel room together, Jason dyed her hair a darker color and then cut it short, as a further disguise - and then they presumably made love together. Bourne decided to pay a visit to Hotel Regina where John Michael Kane had stayed, to get his hotel bill - Marie (impersonating Mr. Kane's personal assistant) was able to easily ask for a photocopy without following through on their intricate plan. Sniper fire from the Professor assassinated Wombosi in his Parisian accommodations as he walked by a window. Conklin then told Ward Abbott that he was positive that the killing was Bourne's doing: "He had an assignment. He failed. He obviously felt compelled to finish the task. We think he'll come back in now." Conklin assured Abbott: "I told you we'd clean this up." By making multiple phone calls and an office visit to follow up on John Michael Kane's identity and whereabouts, plus the news of Wombosi's recent death, Bourne learned that he was a CIA black ops assassin based in Paris, using the name John Michael Kane, in a top-secret CIA project called Treadstone - but he had failed in his mission 3 weeks earlier to assassinate Wombosi on his yacht five miles off the coast of Marseilles in the Mediterranean (when he received two bullet wounds in the back) - for reasons to be disclosed later in the film. Fearing that they were the next targets in Paris ("If we stay here, we die"), Bourne and Marie traveled into the central French rural countryside, where Marie had a friend named Eamon (Tim Dutton) that owned a farmhouse. That night, Bourne told Marie: "I don't wanna know who I am anymore...I don't wanna know...Everything I found out, I want to forget. I don't care who I am or what I did. We have this money. We can hide. Could we do that?" However, they were pursued there the next morning by the Professor. Bourne blew up a propane tank to obscure the sniper's view - and then during a shoot-out in a tall wheat field, Bourne shot the Professor in the arm and chest - he told Bourne as he expired that he also worked for Operation Treadstone (although Bourne didn't fully understand), but that he worked alone: "I work alone like you. We always work alone....Treadstone, both of us...Look at this. Look at what they make you give." Afterwards, an insistent Bourne (who kept $30K of the money and gave her the remainder) sent a reluctant Marie away with Eamon to protect her, although they had both fallen in love: "This is not gonna stop, Marie. You gotta get out now, away from me...You get low, you stay low. No more friends. Nothing familiar. There's enough in there for you to make a life. Any life...I'll end it. Go ahead." He used the Professor's phone to speak to Conklin, falsely reported that Marie was dead, and then proposed a meeting with Conklin in Paris at 5:30 pm that day, in the middle of a bridge named Pont Neuf. Conklin left on a flight to Paris to "clean this up" - and also contacted operatives to assist him. Abbott complained: "You've given me nothing but a trail of collateral damage from Zurich to Paris." When Conklin was not alone on the bridge, Bourne refused to meet with him, but was able to plant a tracking device on one of Conklin's vehicles - giving him the location of Treadstone's Safe House in Paris. There, after creating a car-alarm diversion, he gained access and held Conklin and Nicky Parsons at gunpoint. He asked Conklin: "Are you Treadstone?" as the CIA project director realized: "You don't have a goddamn clue." 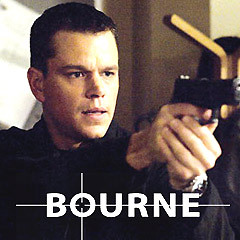 When Bourne asked: "Who am I? ", he was told: "You're US government property. You're a malfunctioning $30 million dollar weapon. You're a total god-damn catastrophe." When asked what happened at Marseilles three weeks earlier, Bourne began to remember his failed mission there as John Michael Kane - he was instructed to make the murder on Wombosi's yacht look like it was executed by one of Wombosi's own men. However, as he was about to pull the trigger on the dictator, he couldn't kill the man who was on the couch with his children (and as a consequence, Bourne was shot twice in the back by bodyguards as he jumped into the ocean). Ultimately, after Bourne remembered, he told Conklin he wanted to call everything off: "I don't wanna do this anymore...Jason Bourne is dead. Do you hear me? He drowned two weeks ago. You're gonna go tell 'em that Jason Bourne is dead...I swear to God, if I even feel somebody behind me..." Conklin refused, and then revealed that he was wired and transmitting Bourne's words. Bourne angrily knocked Conklin unconscious, left Nicky unhurt, and fought off (and shot) several CIA operatives in the apartment's stairwell before escaping. The third assassin Manheim finished off Conklin with a 9 mm Luger (fitted with a silencer) as he emerged into the street - obviously an order from Abbott, who wanted Treadstone closed down, and commanded: "Shut it down." Shortly later, Abbott testified before a Congressional committee that Treadstone was no more, but that there was a new project: "The Treadstone Project has actually already been terminated. It was designed primarily as a sort of advanced game program. We'd hoped it might build into a good training platform but, quite honestly, for a strictly theoretical exercise, the cost-benefit ratio was just too high. It's all but decommissioned at this point... Black Briar is a joint D.O.D. communications program that we really feel has good traction. It's got legs. It'll run and run. It combines elements of..."
In the finale, Bourne reunited with Marie on the remote Greek island of Mykonos, where she was running a scooter rental shop (using the money he gave her when they separated after the Professor's death). He entered and said: "It's nice. It's a little hard to find, but...," and then asked her: "Think I could rent a scooter?" to which she replied: "You have ID?" with his answer: "Not really" - before they hugged. All of the films were loosely based upon Robert Ludlum's best-selling 1980 espionage novel. Ludlum's novel had previously been filmed for TV in 1988 (starring Richard Chamberlain and Jaclyn Smith). The suspenseful action spy-thriller series told about an amnesiac who was on-the-run to discover the mystery of his past. With the tagline: "He was the perfect weapon until he became the target." With a production budget of $60 million, and gross revenue of $214 million (worldwide) and $122 million (domestically).